London - Double amputee Oscar Pistorius's historic Olympic campaign ended on Thursday as the South African team failed to complete their 4x400m relay heat. Ofentse Mogwane fell on the final bend of the second leg as Pistorius, the first double amputee to compete in Olympic athletics, waited to take the baton. Mogwane had moved up to fifth on the leg, but rounding the bend into the final stretch, he made contact with Kenyan Vincent Killu and both came to grief. "Somebody spiked me," said Killu, who unlike Mogwane was able to get up and continue. 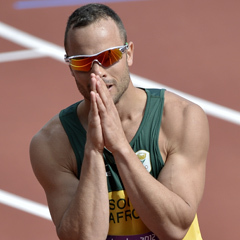 Pistorius put his hands to his head, walked to the side of the track and sank to his knees staring down the straight. Mogwane received medical attention and left clutching his shoulder.